For the last few years, I've been scratching away at the personal history of Tin-Eye (Robin W.G.) Stephens, former commandant of MI5s secret interrogation centre, Camp 020. I've discovered quite a bit about Tin-Eye - his parents, his brother who died in WWI, the death of his second wife. But the death of Stephens continues to elude me. I even ordered his military records from the British Army Personnel department - they were sketchy to say the least. There is one long shot that I haven't tried yet - the informant at the death of his second wife. But it's a seriously long shot. Let me walk you through it and maybe someone can suggest a way forward. In the late 1920s, Stephens married Phyllis Gwendolyn Fletcher (nee Townshand) in India. 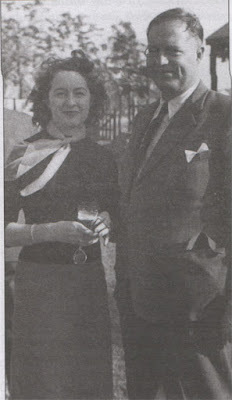 They divorced in 1933 in London. After that, there is no record of Stephens ever getting married again except... in Oliver Hoare's introduction to the book Camp 020, there is a photograph of Stephens with his second wife - Joan Geraldine Pearson Dowling. That's it... there is no marriage registration for Joan and Stephens - at least not one that I've been able to find. So... what do we know about Joan? Well, her birth was registered in December 1919 in Lincoln, Lincolnshire and her mother was a Pearson. Birth registrations were recorded in three month intervals, so a December registration would mean her birth took place in Oct-Nov-Dec of 1919. Do enough searching on Ancestry.co.uk and you will find other references to her with the surname Stephens, primarily from passenger lists. She is sometimes listed as traveling alone and at other times she is in the company of our friend Stephens. On 9 April, 1992, a Joan Geraldine Stephens passed away in Lincoln at a nursing home. According to the death certificate (which I ordered from the General Record Office), this Joan was born on 4 September 1919 in Lincoln and her maiden surname was Dowling. So far, so good. She could have been born in September 1919 and perhaps her birth wasn't registered until the following month. On Joan's death certificate, her deceased spouse is listed as "Caesar Stephens, Army". Now, Joan and Stephens had spent time in Madeira, the Portuguese islands off the coast of northwestern Africa. Their last visit that I was able to track was in 1960, the year that Stephens retired from the Army at the age of 60. Still... it's a bit odd. Perhaps Stephens picked up a nickname during his time abroad? At least we know that Stephens must have passed away sometime between 1960 and 1992. Audrey passed away on 22 October 2005 and her address was 154 Nettleham Road, Lincoln. Sooo... pretty sure this is the same Audrey who was the informant for Joan's death. According to the death index, Audrey was born on 5 December 1922, so a few years younger than Joan. The birth index notes that Audrey V. Dowling's birth was registered in March 1923 (within the right ballpark) in Bedwellty, Monmouthshire (strange location - not Lincoln). Her mother was a Pearson. In June 1948, a marriage was registered in Lincoln between Audrey V. Dowling and Keith R. Richardson. A search of births in Lincoln between 1948 and 1978 yielded no children whose father was Richardson and whose mother was Dowling. Either Keith and Audrey were childless, or they got divorced before having any children, or they moved (seems unlikely) It would appear that Audrey did not remarry. All of this is rather disappointing. Joan apparently died with no children and Audrey as well. Sooo... any papers or photographs from our friend Stephens would appear to have been lost or... perhaps there were nieces and nephews. Audrey's death notice in the Gazette gives the name and address of her solicitors in Lincoln. Which finally brings me to the long shot... to write to them and enquire if they have a family contact for her. A second long shot would be to dig into the newspaper archives in Lincoln and find an obituary for Joan Stephens. Hard to do from the west coast of Canada. Any other long shots I'm missing? Geraldine Pearson Stephens.—Dated igth May 1942. CHARLES ROBINSON and SON, 2, Lampton,(042) Road, Hounslow, Solicitors. Wow! Thanks Stephen - excellent sleuthing. That would explain why I've been unable to find a marriage certificate for the two of them.